This is connected with my blog post called ‘Hot Dogs and Horse Lasagne’ and my attempts to ensure my family eat in a healthier and more responsible way. This is my very first step! 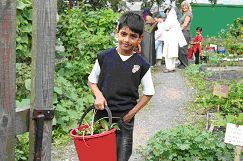 I’ve registered with a local veg box scheme called Cropshare which is run by Burnley Food Links. The aim is to buy less produce from supermarkets, invest more in the community rather than in huge corporations and to eat more healthily of course. Here’s my experience so far. This is not a sponsored post and I’ve forked out for this myself, they don’t know I’m running this review. I think sometimes you get a fairer view of things if you experience a service as any other customer would. 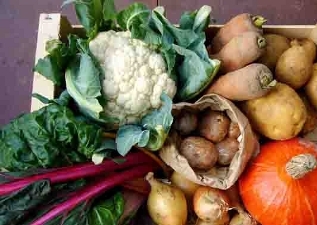 This is the picture from their website, I wondered if the veg would look like this once it was delivered…. Yesterday I went to their pick up point at my local town to pick up a standard size veg bag. They don’t deliver to your door which I actually think is a great idea, it saves on their petrol costs and you can simply go into your pick up point (all very accessible) while you’re out shopping and get your supplies. This means you get to choose when it’s most convenient to go and get it, you don’t have to wait in for a delivery which is a bonus. The veg was all neatly packed up in brown paper bags in this tough, easy to carry reusable bag – no plastic bags or boxes here! Every time I ask Tesco to supply my online order without plastic bags, I get a minimum of four of the things regardless of my request, if not more than that. I got a bottle of wine in a plastic bag in my last order, this annoys the hell out of me. Here everything is recycleable and reusable. Even the tag on the side of this bag that had my name on it had a child’s wordsearch on the reverse of it, they’d recycled the paper. I’m impressed at the attention to detail. After you’ve picked up your order you simply return your bag to the pick up point so it can be re-used for your order the following week. 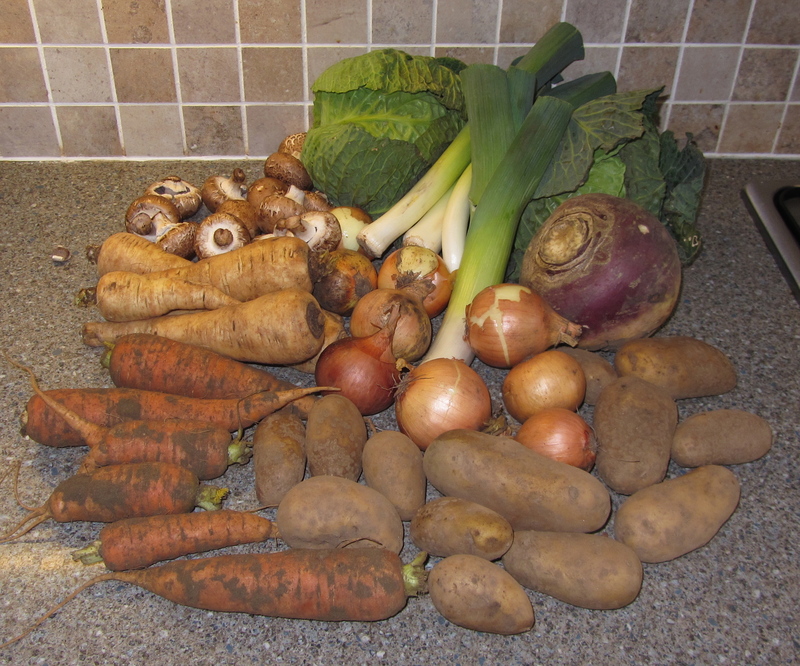 Here is the veg for this week, every veg bag contains basics such as potatoes, onions and carrots for example, along with seasonal treats such as asparagus. This is a standard weekly bag, you can arrange for a smaller bag if you wish. All of the veg was in good condition and I didn’t have to fish any manky mushrooms out or throw any bendy carrots in the bin. There was a little bit of soil still on the produce, but it wasn’t excessive and from what I gather this helps to give your veg a longer shelf life. I didn’t mind at all. A quick rinse before food preparation and it’s all fine. As I was a new customer this recipe book was included. 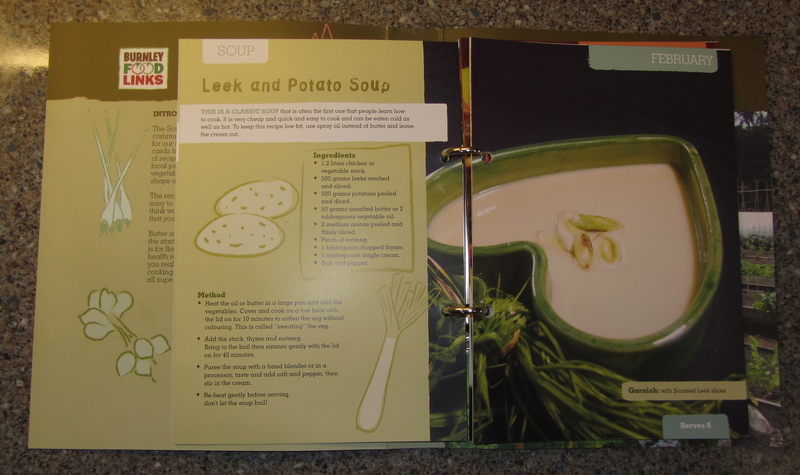 It contained practical soup recipes and other ways to use veg. 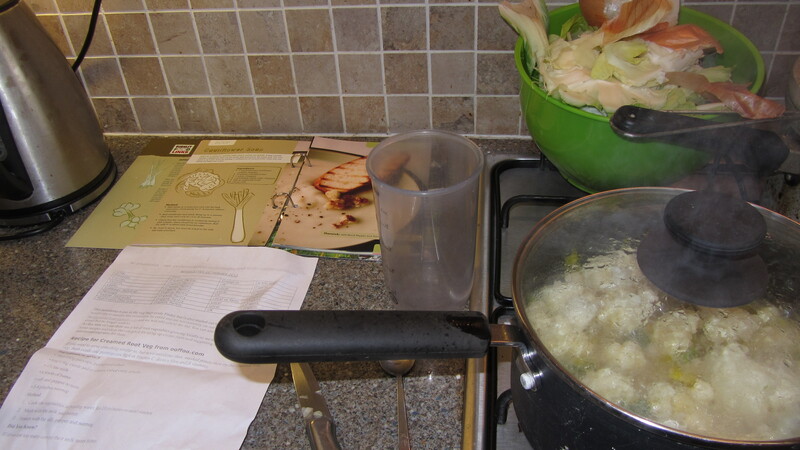 Each section featured a different month and recipes related to seasonal veg available at that time. 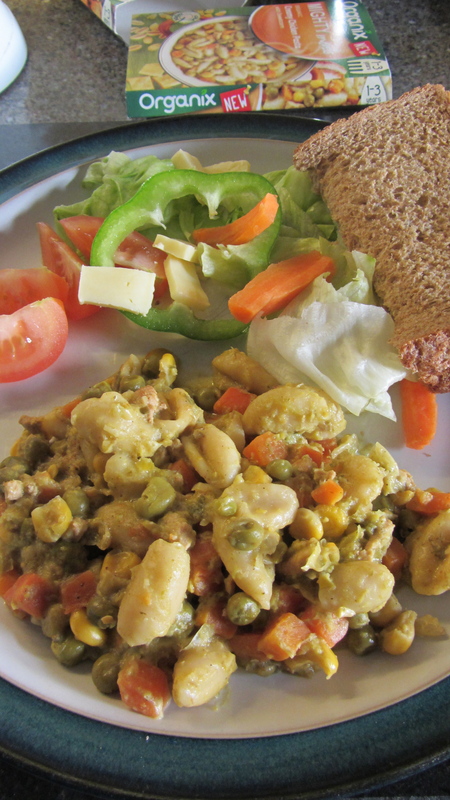 This recipe will be lovely for cold spring days when the wind chills our noses and toeses. The veg is locally grown in allotments and schemes in this area and any profits made are reinvested, so I’m helping my local community by buying from Cropshare I love that this is a not-for-profit organisation so I know I’m not lining the pockets of some rich bloke in america. They say on their website that they have strong links with all of their growers and pay a fair price. Cropshare keeps profits local and has a community base. A standard bag containing 8-9 types of veg is £10 a week (paid monthly) and a small bag has 6-7 types of veg and is £6 a week. All the food in the bags ‘is either certified organic or accredited by the Climate Friendly Food scheme’ too. Can’t be bad! They accept Healthy Start vouchers too which is a bonus. My one main concern is been that I’m not a great cook and I’m not known for being inventive (in a good way at least) – so will I end up with a ton of veg rotting in the cupboard unused? I hope not. They do supply a sheet of paper with a recipe on it with each order which will help to inspire me, but I’m going to have to work a lot harder in the kitchen to come up with ways to use all of this. I am a little disappointed that the newsletter appeared to be a list of where the food came from, what it is (for example a Tundra Cabbage), and just a recipe. 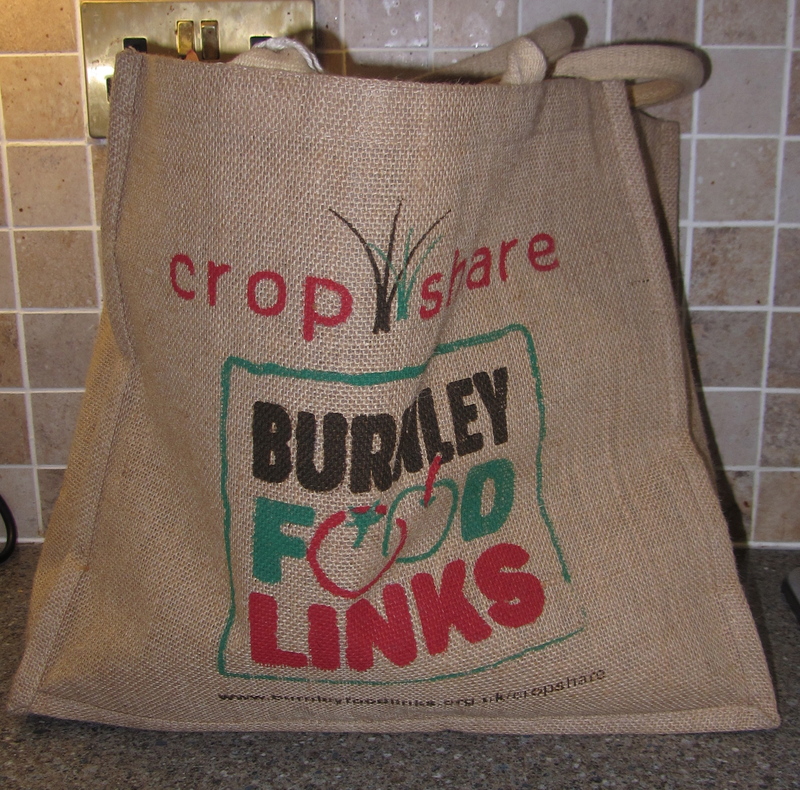 I’d love to have heard more about the different schemes that work with Burnley Cropshare and updates on progress within the organisation or maybe general food news, but I guess that would be an added expense for the organisation if they had to produce that every week. Still, it would have been nice! Maybe something done on a monthly basis would be an idea? I hope they don’t mind me suggesting that. Then again, there’s a lot of information online about their work already. A few more recipes on the newsletter or a bit more information about food issues would be interesting, but an added cost I suppose. So does the food taste better? Is it worth it? I’ve noticed that the veg does seem crunchier so far, no mouldy produce and I’m pleased with the quality. As for if it’s worth it, I’ve yet to find that out. It depends if I can use it all, maybe I’ll get a smaller bag in future if there’s a lot left over or if it goes ‘funny’ before I’ve managed to cook it. I’m planning to use more of this delivery for our food for the week and am going to try and buy less meat and other odds and ends. That should save me a little at least. I would prefer to eat less meat anyway so this isn’t going to be too bad for me at least, although my family might feel differently. All I can say is, if they don’t like it, they can either lump it or make their own meals. Selfish eh! Maybe. 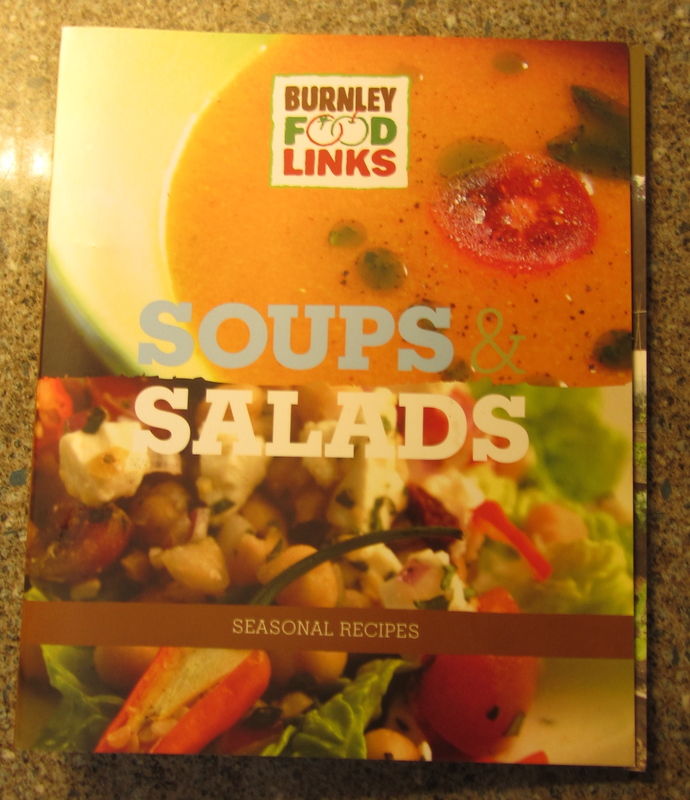 If you’d like to read more about Burnley Food Links please click HERE. Today on the school run a wagon carrying a load of live pigs or maybe cows drove past us, destined for the abbatoir further down the road. It stank to high heaven and the stench lingered long after it had passed. All three of us held our noses and went ‘Poooh!’ It was horrible. Who knows how long they’ve been in transit and what the conditions were like on the inside of that wagon? I shudder to think. It’s easier not to think about it, but probably not a very responsible thing to do. My next plan is to buy from our local butchers, eat less meat in general and try to avoid the supermarket pre-packaged stuff when possible. This is my plan. I will fail sometimes I’m sure, but if I keep trying I can relieve my conscience a little and perhaps improve our diet and our health as a result. Baby steps. Hot Dogs and Horse Lasagne. 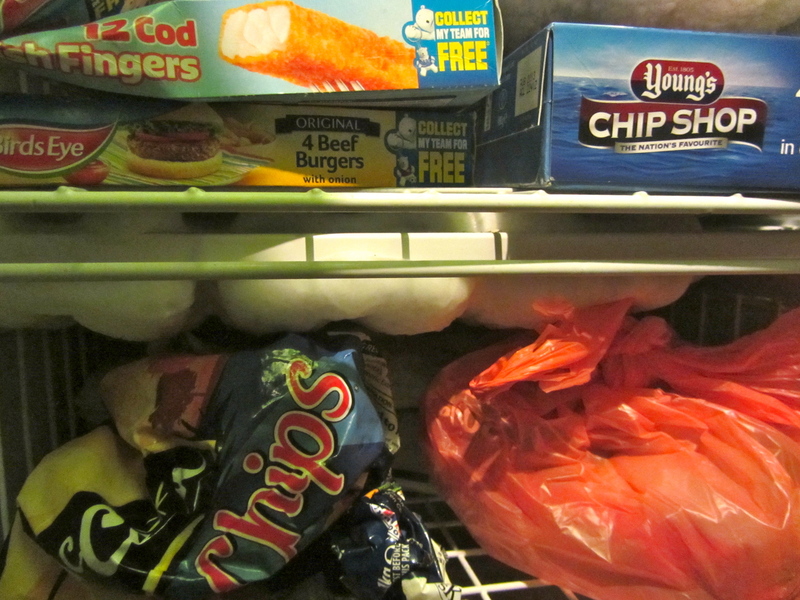 This week I spent more time than usual staring suspiciously at the contents of my freezer. I think I have a selection of fish fingers, turkey mince, beef mince, frozen chips, mixed frozen vegetables and a small chicken in there – but do I? Could I really be storing an unusually large rabbit, frozen lumps of squishy multicoloured flavoured playdoh, minced monkey fingers coated with breadcrumbs and mechanically minced and reformed potatoes. It’s anyone’s guess really. Do I know where the food originated from? No. Did I even check the packets for ingredients before I bought them? No. Should I be feeding them to my family? Maybe not. This is a competition! Pls post a comment if you’d like the chance to win an afternoon defrosting this freezer. I shall keep you company and shout encouragement. I might even let you borrow my hairdryer if you promise not to electrocute yourself and sue me. Tell your friends! This is a once in a lifetime competition, don’t miss out or you’ll be left in the cold. Ba-boom-tish! It’s shameful really. Here’s the sum total of my knowledge. A little red tractor on packaging is good, I think it means that the food came from British farmers. And then there’s a long pause while I think for a while and drink tea……….nope, that’s it. I know almost nothing else about food standards. I hang my head in shame and remember that I fed my kids cheap chicken nuggets the day before yesterday. Bad, bad me. What the F are we eating? Every now and then when I’m feeling very virtuous I’ll do a load of over complicated home cooking which is fun, but very time consuming and sometimes inedible. This drives me to freezer fodder. At least the kids eat it! But then that is probably because they’re laden with salt, sugar and additives. It’s lazy and bad for them. I’ve always thought I should make more of an effort and I have to say this week’s food labelling fraud news has been a kick in the backside for me. I really need to review what we buy, where it comes from and how it affects our health. I copied this image from here: www.stuartwilde.com thought it summarised the situation nicely. 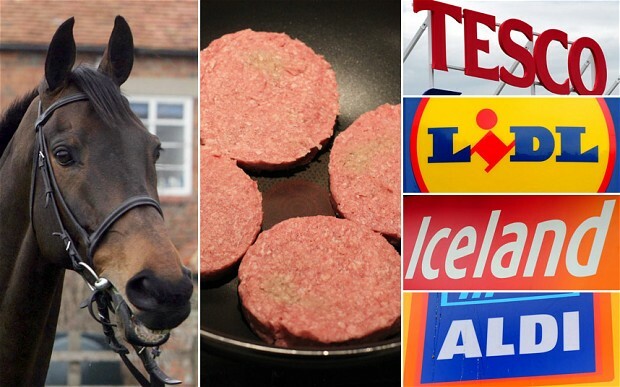 Horse+Burgers=Careless Supermarkets. I hope Stuart doesn’t mind. If we are what we eat, I don’t want any of us turning into processed lumps of pink reformed sausage meat. Dearest Horace, I love you dearly, but if you want hot dogs (which very well could be reconstituted dogs if these revelations are anything to go by), you’ll have to buy them and cook them yourself. Eating healthily can’t be that hard can it? I have decided to make a few definite changes. A) Find a practical easy to follow cook book with simple recipes in that don’t involve stupid exotic ingredients I can’t find – and use it! (instead of just reading it). 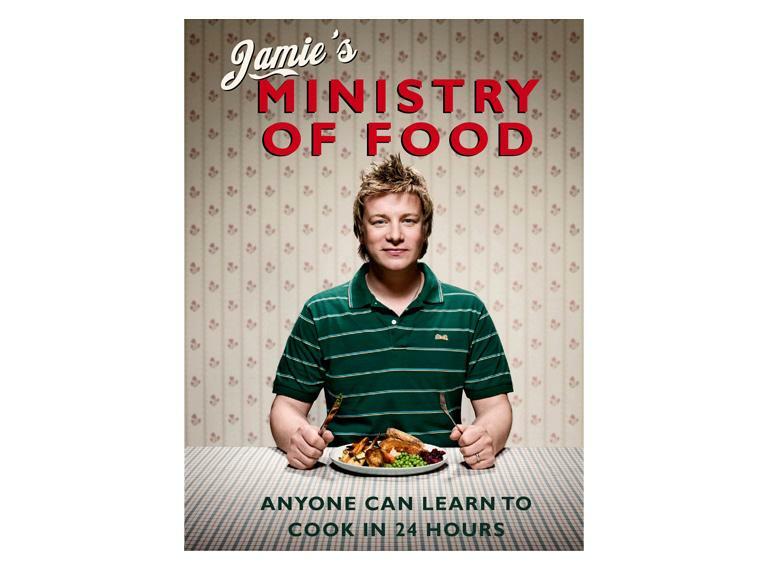 This cookbook seems ideal, it works on the principle that anyone can learn to cook which is a good start as I’m no pro. ‘Oh Ministry of Food, save me from Processed Food Hell!’ Kay kneels in front of the oven in mock prayer. Seasonal, local and organic. Doesn’t get much better than that. My Mother In Law gets swamped with pumpkins every now and then with this scheme, but she has the best pumpkin cake recipe in the world which I plan to steal, so I reckon this is still a practical option for us. I’d feel so much happier knowing my meat was properly sourced. Is this too expensive and ‘posh’ for the likes of us though? D) Processed meat is off the menu and in the bin. If we want meatballs we’ll make the things. They’re only balls of meat when all’s said and done aren’t they. In summary! If we do all of these things we will probably be a bit skint, but I’ll feel a whole lot happier about what goes on our plates and in our tummies. I’ll also have to invest in more time spent cooking, but so be it. There’s no harm in trying. I’ll be honest, this recent news story has really made me reassess our nation’s current eating habits and more importantly ours. Perhaps it’s time for a change. If anyone out there has had similar thoughts, I’d appreciate the feedback. What do you do to ensure your family eats healthily? Where do you shop? What do you cook? What do you look for on food labels? How do you do this healthy eating thing? I want to know because I think my lazy days of eating whatever falls off the supermarket shelf at the cheapest price are over. I know I can’t be on my own here. This is not a sponsored post and is nowt to do with with any of the companies mentioned on here. The Xmas tree is expertly decorated and styled. The house is not falling down in the background, that is an illusion. Clever eh? Darlek the Red Nosed Reindeer! Had a very baubly nose! Father Christmas was on anti-biotics for toothache so he had to drink milk instead of sherry. Father Christmas was not very happy about this. T’was the night before Christmas, when all through the house……..Not a creaure was stirring, not even a mouse……. but if you listened very, very carefully with your special Xmas ears you could hear the distant sound of vomiting at about 4.30am. Takeaway Xmas dinner. I was supposed to be making it all at mum’s house, but because we had the dreaded up-chucking bug we thought it best not to go round. My mum meticulously made all the turkey dinner (even the starters! ), bagged it up in plastic sealy bags and Horace went and collected it. That’s a huge round of applause for my parents. I’m biased, but I reckon I have the best mum and dad in the world. Felt awful that they had to spend Christmas Day on their own, but Norovirus for Xmas is not a nice gift. Spent a couple of days at Grandma and Grandad’s and had a lovely evening at a family party. I think everyone else had a great time at the do, although i went to bed at about 8.30pm with tummy ache – I didn’t completely miss out though. In true owl fashion I woke up at 2am when everyone was going to bed. Shucks. I’m brill at parties. Really I am. And here is the reason why we have had a truly traumatic Christmas or ‘the worst Christmas ever’ as Darlek put it……..it’s a ‘BUG’. Ok, so maybe it’s a bee, but it is sort of a bug. To the untrained eye it definitely looks bug-like. We have had coughs, colds, throwing up, random scary spots, belly aches and an all round excess of bugs. Next year we will have a fabulous Christmas, bugs will be banned. I shall bath the kids in Dettol for the weeks preceding Christmas and no-one will be allowed to cough, sneeze or go slightly green. December is a no go zone for Norovirus and snivelling snuffles. Or else….’Or else what?’ you might say. I dunno. Perhaps I’ll just get some anti-bac spray and run around the house like maniac screaming ‘Die, you mother-fecking, Xmas ruining, putrid, minging little bugs!’ ‘Die, Die, Die!’ Next year will be different…..
Oooh, and I got a fabulous blue and black stripey onesie for Xmas. MUST mention this. I think I look like Thing One or Thing Two from Dr Zeuss (except a different colour). Horace thinks I look like I’m in some strange sci-fi outfit. All I know is that I am warm as a very, very warm thing and would live in it given half a chance. Bliss, I can wander around like a Dr Zeuss character or a space being, wearing purple slippers for the vast majority of 2013 now. I is a fashion icon. Ayr Food Bloggers Conference – I’m going! Thanks to Sainsburys Family Blogger network I’ve been given a ticket to attend the Ayr Food Bloggers conference! Can’t wait! This weekend I’ll be staying with Elaine from the Fun-As-A-Gran blog and meeting a load of other food bloggers too. Soooo excited! I’m now off to find some clean jeans, a nice shirt, charge the camera and my phone, starve myself in preparation for sampling some beautiful food and quadruple check the train times. Wish me luck! I’ll post about it all afterwards! The full day event will feature a spectacular local food tasting lunch with lots of opportunity to network with fellow food bloggers. We are on schedule to attract 25 participants, including food bloggers, restaurateurs and hotels reps all interested in food blogging. This is Scotland’s first Food Bloggers conference and we are capping the number of people attending to 25 to try and keep the conference as small, informative and intimate as possible. Attracting Food Bloggers from across the UK, the inaugural Taste Ayrshire’s Food Bloggers Conference will herald the beginning of the Taste Ayrshire week long Food Festival. 10.00am-11.00am: Finding the best Produce and Showcasing Food for your Blog with Justin Galea. 11.15am-1pm: Using Social Media to Promote Your Blog with Colin Kelly. 1pm-2.30pm: Tour of the facilities followed by a cookery demonstration from Ayr Racecourse’s talented and entertaining Executive Chef, Donald McInnes. Followed by a delicious plated lunch using the freshest and finest Ayrshire local produce. 2:30pm-3.30pm: Fine tune your Food Writing with John Cooke. 3.30pm-4.30pm: Food Photography Masterclass with Darren McKean. 4.30pm – 5.30pm Food Promotion with Christopher Trotter. A native Australian, Justin Galea was raised by his food-loving family who originate from Malta. He trained at Melbourne’s leading school for food, tourism and hospitality training gaining experience in the large range of restaurants in the sprawling city. In his early twenties, Justin gained his first Michelin experience at the Lynch’s Winter Garden Restaurant in Melbourne where he was one of the youngest sous-chefs. This is where Justin learned the Escoffier classics that continue to inspire him today. At the age of 23, Justin left Australia to travel and whilst in Scotland was recruited to join the world’s first golf resort, Turnberry. Starting as Chef de Partie but quickly promoted to saucier and later the fish station in the bustling Turnberry kitchens, he was then promoted to Sous Chef. After four years, he returned to Australia to rejoin his family, but he soon missed the creative buzz of Turnberry. He returned in 2008 as Chef de Cuisine and oversaw the hotel’s re-launch of its kitchens, recreated the food offering and preparing for the return of The Open Championship in July 2009. Now Turnberry’s Executive Chef, Justin oversees the full food and drink offering at the resort. Colin Kelly is a broadcaster and journalist regularly seen and heard discussing gadgets and technology on television and radio. He’s best known for his time as resident gadget expert on STV’s ‘The Hour’ and has previously presented programmes on BBC Radio Scotland, Real Radio and Clyde 1. He’s been a newspaper columnist and is a regular blogger through his websitewww.colinkelly.net. Much of Colin’s work these days is with Hillington based digital consultancy NSDesign where Colin travels the country delivering social media training to a wide range of businesses and public sector organisations. Hailing from Cape Town, but now resident in Edinburgh, John Cooke is a professional writer. John is one of the lead reviewers and section editors for The List Magazine’s Eating and Drinking Guide. John also writes regularly for The Larder magazine and its regional offshoots, covering a variety of Scottish foods and specialist producers, farmers and fishermen. John has been a judge at the Great Taste Awards and the One World Chutney competition and is part of Slow Food Edinburgh, promoting food that is ‘good, clean and fair’. Darren McKean is a professional food photographer based in South West Scotland. A lifelong foodie, he is now on the final countdown to his 40th birthday. Together with his wife Fiona he runs Fiona McKean Photography. Darren’s interest in food photography was sparked whilst photographing weddings with Fiona. Says Darren, ‘some of the food was so impressive and I found myself drawn to photographing it’. He took the decision to concentrate solely on food early in 2011, with his first commercially styled shoot for an artisan bakery and he has never looked back.Darren has now worked with a range of food producers, suppliers and restaurants along with supplying a leading food imagery agency with his mouthwatering delights! Christopher Trotter is a well known Food Writer and Consultant, with 5 books on cooking and food under his belt including ‘The Scottish Cookery Book’ and ‘The Whole Hog’. An acknowledged expert on cooking and Scottish produce Chris is currently working on his Food Tours, Cooking Classes and team building programmes using food and cooking in workshops. Chris has researched for major Food Guides and written for a variety of media including the List’s Fife Larder and the Fife Diet and is a regular on the BBC Kitchen cafe on radio. 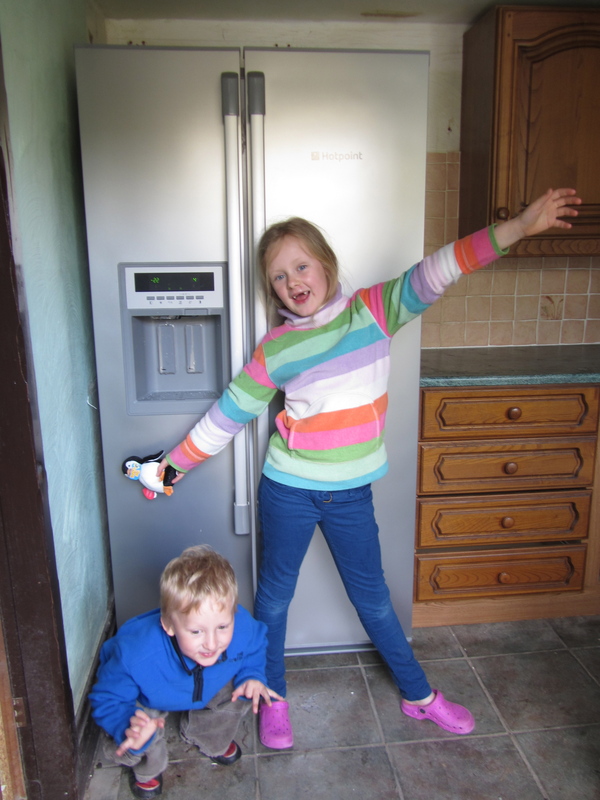 Hotpoint American Fridge Freezer MSZ 900 NDF Review – Appliances Online! 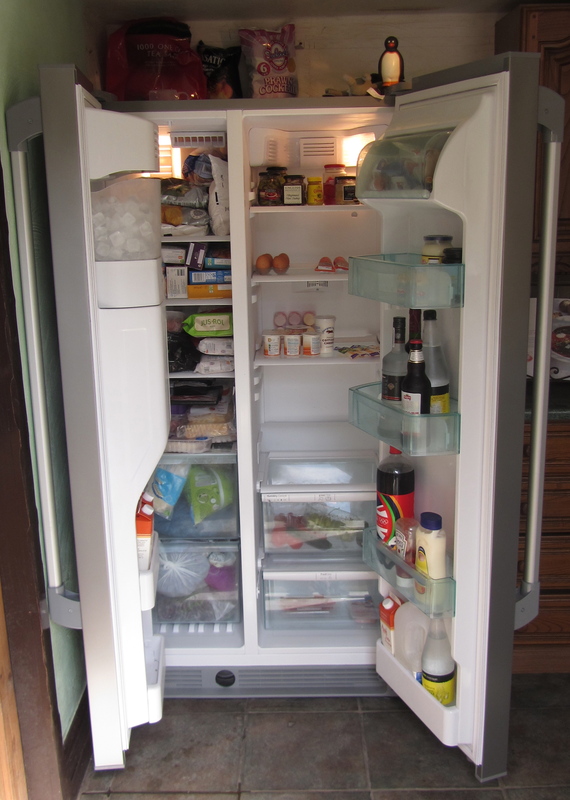 Hotpoint American Fridge Freezer MSZ 906 NDF Review From appliances online! 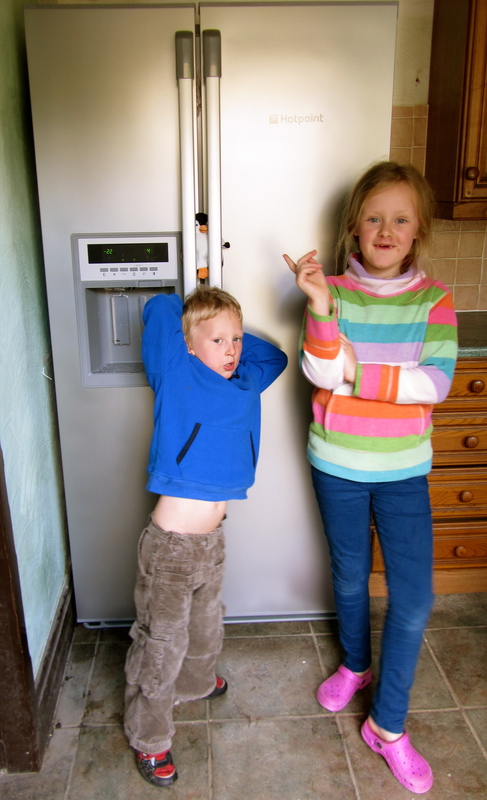 This is the ‘straight’ review, ie, no penguins featured – although they will be featured alongside this fantabulous fridge freezer in the Penguin Amnesty vlog which will go live next weekend. Here’s my YouTube review, I hope you enjoy it and I especially hope you’ll notice the meticulously painted nails and not the scruffy hair. I think the vlog review speaks for itself in many ways, we do really think that this is an amazing bit of kitchen equipment. It is silver, sleek, shiny and ever so stylish. The rest of the kitchen looks downright dowdy in comparison in fact! This is a photograph of the fridge freezer in its entirety, you can see all of the shelves and just how much you can fit in there. There’s absolutely tons of room, more than enough for a hungry family of four! The kids have said it’s like a Dr Who Tardis and I can only agree, it looks like a large freezer, but when you open the doors it’s really quite amazing how many shelves and doors and twiddly bits there are to make use of. It’s actually massive! Fits tidily in a corner too! Sausage is preparing to jump up really high by the way, or maybe he was doing a frog impression, your guess is as good as mine. The features on this Hotpoint American Fridge Freezer are something else too! When I first looked at the control panel, I’ll admit I took a deep breath and thought ‘Hmmm…. maybe I won’t be able to work this after all,’ but I was wrong. It really is quite straightforward. Most of the controls are described in the above video, and as you’ll be able to see, they are very self explanatory. In summary, via the controls you can arrange for ice-cubes, crushed ice, filtered water, temperature control (fridge & freezer), ‘Holiday Mode’ (switches off the fridge if it’s not in use), quick freeze and there’s even a button disable function so you can freeze the controls and stop your kids having a button pressing frenzy. When everything else goes wrong, at least you have your fridge freezer to turn to! I’ve included a photograph of this here as you can’t see it very clearly in the video blog. Never in all my years of fridge using, have I seen this! 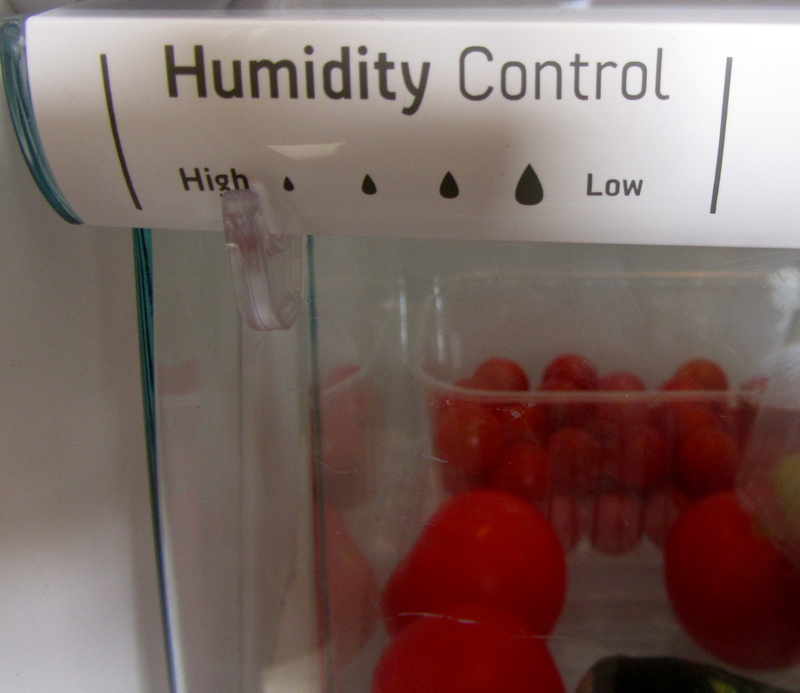 This shelf has a ‘Humidity Control’ panel, if you’re storing fruit and veg with skins, such as cucumbers or tomatoes for example, the high setting keeps them at their optimum humidity level and they stay fresher for longer! No more wrinkly tomatoes (unless you leave them for absolutely ages I suppose). Lower humidity levels are perfect for leafy vegetables, so lettuces won’t lose their crunch. The little plastic lever does seem a bit stiff to push along though, and I hope I’m wrong, but I do think it might be a bit prone to breaking, only time will tell. This is so clever! The box at the bottom of the fridge is specifically designed to keep meats cool, such as ham, or mince, or chops maybe. Cool air is piped into the box from the freezer and everything is kept separate and more chilled than in the rest of the fridge which as we all know, is important when storing meat. 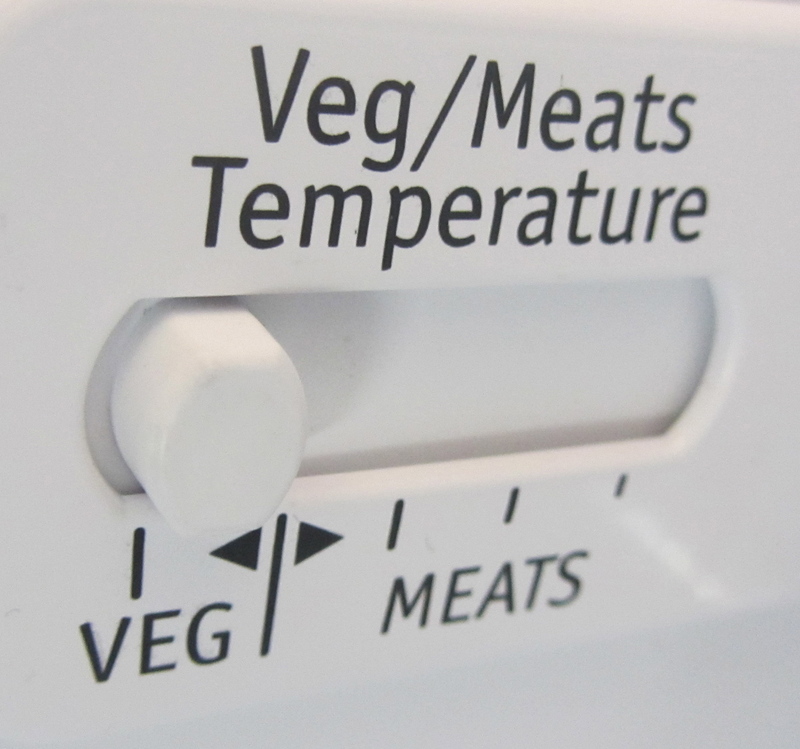 If you’re vegetarian or if you want to simply store an excess of vegetables in there instead, you just slide the knob across to the ‘VEG’ setting and it works almost exactly as the shelf above. Neat eh! Wiggly shelves! Brilliant for storing bottles and jars. 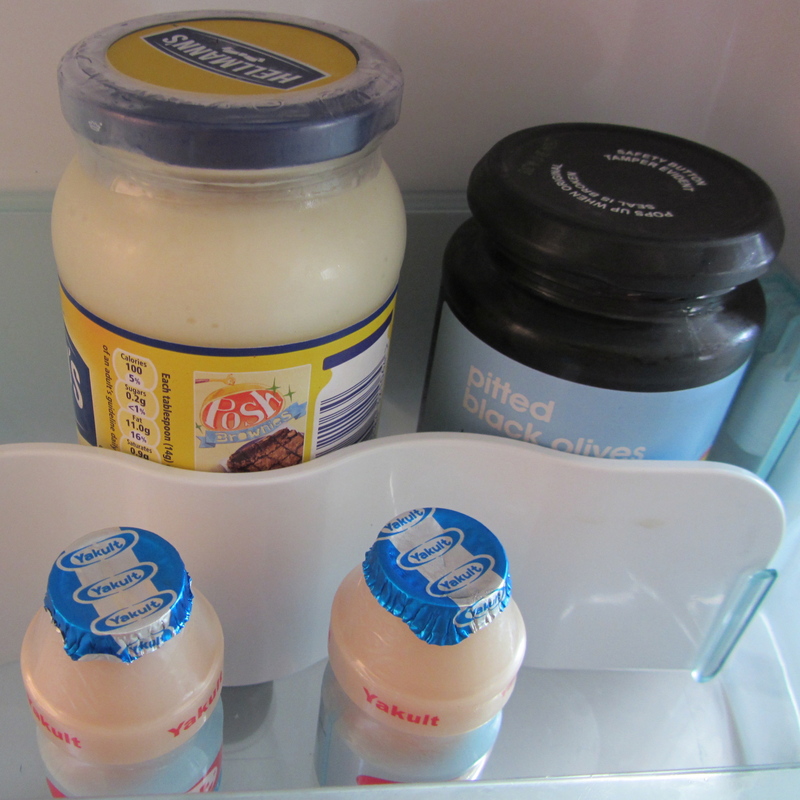 I do like that some of the shelves in the fridge door are a wibbly, wobbly shape, apart from being aesthetically pleasing, they are excellent for storing jars and bottles and keeping them in place. If you open the door at speed, you don’t have a load of breakable jars and bottles skittering from one side of the shelf to the other. Not that I’d ever do anything like that, I’m always calm, cool and collected in the kitchen. (Kay coughs and looks shifty….). They’re also very deep shelves so you can fit loads in the door which is very easily accessible. The freezer has similar shelves too so you can grab things very easily without having to root about in the freezer getting frostbite if all you want is a carton of juice to defrost. Speaking of frostbite, I’m so pleased that this is a frost free freezer. Our old freezer is what can only be described as polar bear territory. It gets absolutely covered in inches of ice, the shelves jam because they’re covered in frost, things get frozen in blocks to the back of the drawers and won’t come out and it is a nightmare compared to this dream of a fridge freezer. No frost, equals no worries. I can just reach in, grab stuff and that’s it. Packages of slippery frozen peas can be bunged in the bottom covered drawers so they don’t fall all over the place, and boxes can be neatly stacked at eye-level where I can reach them easily and conveniently. And the best feature of all! Ice!!! There is one stand out gem of a reason to buy a Hotpoint MSZ 906 NDF American Fridge Freezer. Ice! ice, ice and more ice! And filtered water too! Nothing beats wandering over to this sleek beast of a freezer and just casually filling a wine glass with ice cold filtered water, with a choice of either crushed or cubed ice. 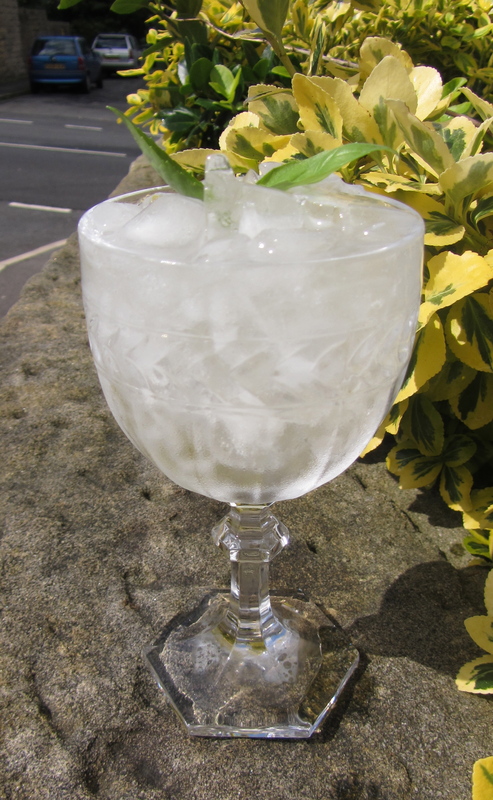 This turns a simple glass of water into quite the occasion! Home-made cocktails become a real possibility and I’m warning you, it’s a slippery slope on a Saturday night. I speak from experience! The water filter is easily replaced and the control panel does warn you when it is nearly time to change it. This gives you a bit of time to organise a replacement filter, so you’re not abruptly left with a water filter that you can’t use. In summary! This is an A rated appliance and it’s easy to see why. 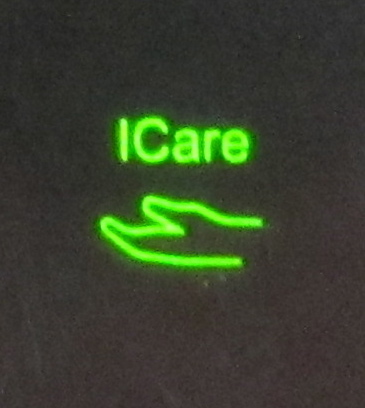 It saves energy where possible by way of the ‘Holiday’ setting and the hilarious and practical ‘I Care’ setting too and it yet it still maintains an optimum temperature for all your food. The alarm that sounds after either the fridge or freezer door has been left open for more than 2 minutes will save you from accidentally spoiling the contents and you will fall head over heels in love with the ice-maker (well I did anyway!). My only concern is that it is a little over complicated, but it simply has to be that way in order for it to be as perfectly designed as it is. But…the more features it has, the more there is to go wrong maybe? The plastic lever on the veg box is rather clumsy too, but that is a minor point. Having said that, there are all the usual guarantees so I’m not overly worried. So, from me, Horace and Darlek and Sausage! Thank you Appliances Online. You are simply the best! Thanks so much to Appliances Online for being sending us this Hotpoint American Fridge Freezer MSZ 906 NDF to review, if you’d like to have a look at this fridge freezer yourself on their site, please click HERE! They have a huge range, in different colours, shapes and sizes. (well they’re all vaguely rectangular at least). This is a sponsored post, I was sent this product to review, no other financial reward has been given and all my thoughts are my own – as always! The Organix website shouts ‘Start a lifetime adventure with food!’ which I think makes a great opening line for this review. We’re all good eaters at this house so we were all very pleased to be asked to try out some of their yummy grub. 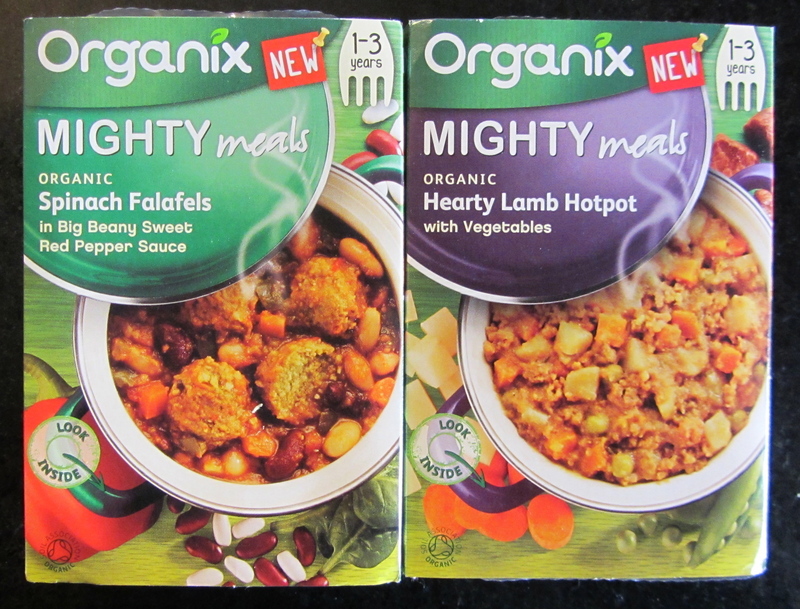 My kids are definitely beyond weaning, which is really the target audience for Organix meals, but they’re not beyond appreciating decent food. So we revved up our tastebuds and had a munch on some of these. Here’s what we thought! Nice packaging, convenient to store (doesn’t need refridgerating), looks wholesome. All good so far! 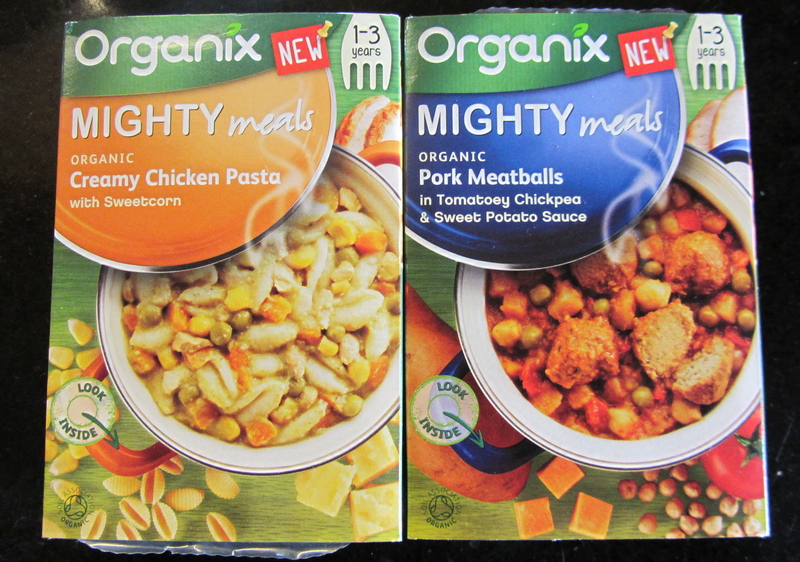 I think Organix meals are a great idea for parents who have limited time, but still want to make sure their kids are getting ‘proper’ food. When my two were younger I experimented with making my own baby food and toddler food, and although it is definitely a fun thing to try, if you’re surviving off a minimum of sleep due to teething and tantrums, it’s not always easy to get on with. These meals, in my eyes anyway, are a guilt free short cut. 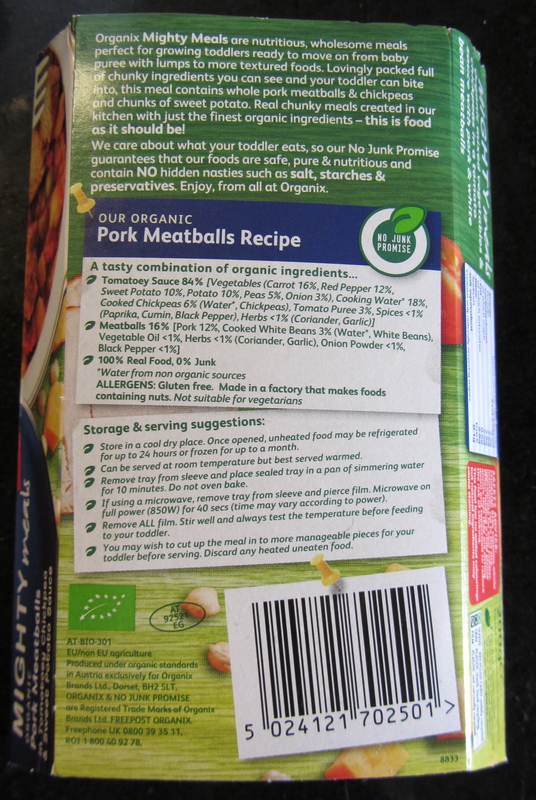 Check out the ingredients on the back, no strange sounding additives you can’t pronounce – all familiar sounding food stuffs which is reassuring. If you made this meal yourself, I should imagine the ingredients would be almost identical. Creamy chicken pasta! 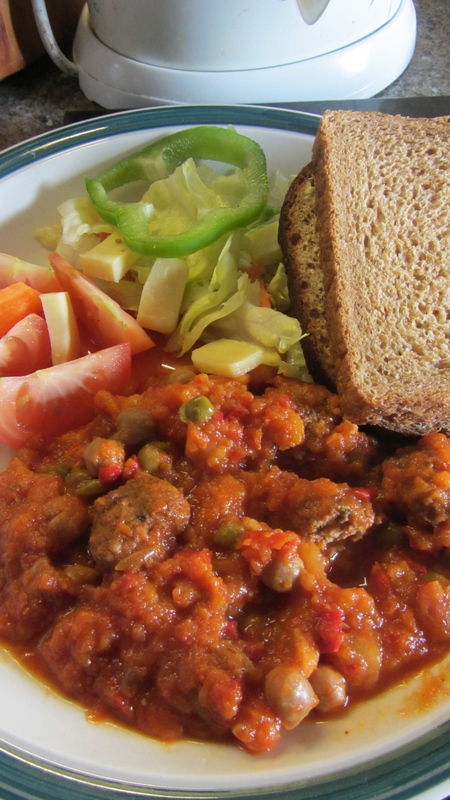 You can see all the meat and veg, no grey ‘mush’ here – nicely textured for a toddler to get their teeth into. 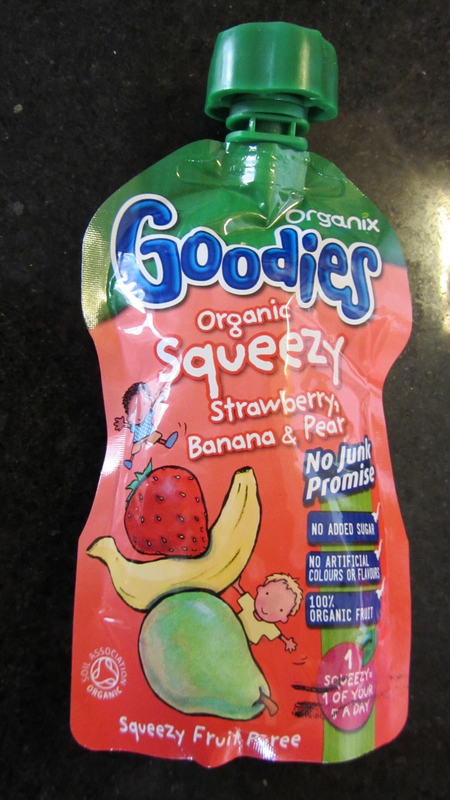 This looks like grown up food, but it’s just soft enough for kids to easily manage with their new grown teeth. It’s not cooked into soggy oblivion which helps get them used to eating ‘real’ food. 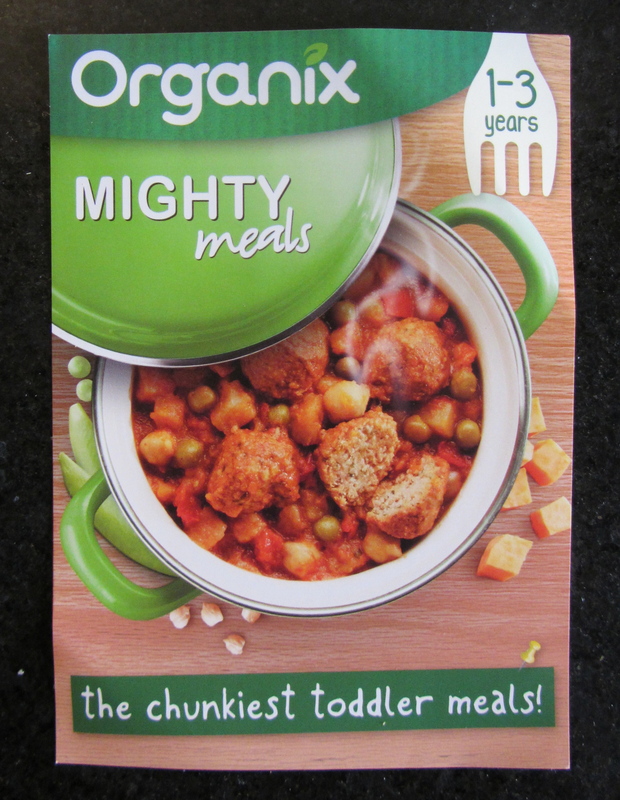 My question is, are these meals for chunky toddlers, or is it chunky food for toddlers? I think I’ve said ‘chunky’ too much. It’s one of those words that sounds daft after you’ve said it more than three times. Chunky-chunky-chunky! 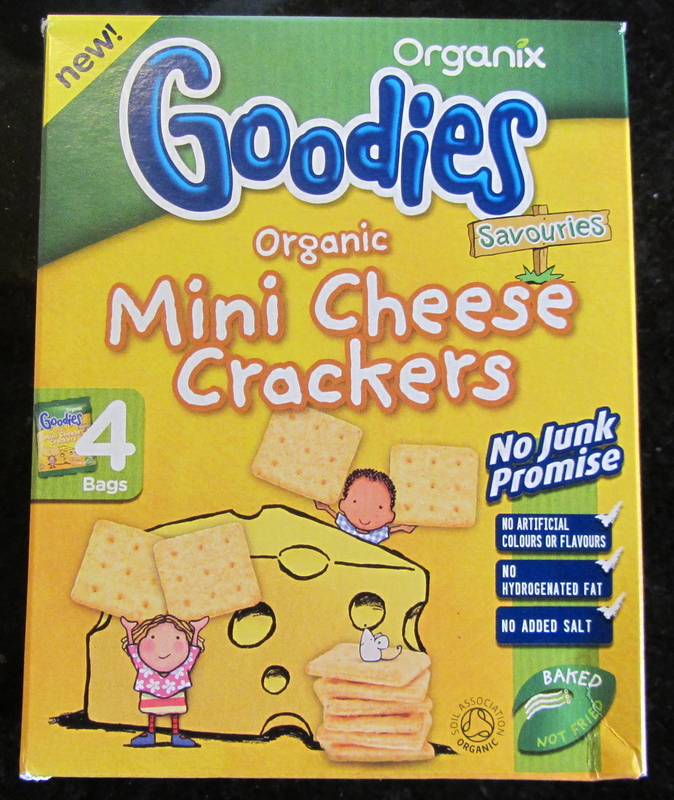 Another question, were these crackers made from very small ‘mini’ cheeses, or is it because they’re mini and fit easily into a toddler’s hands? Answers on a postcard please. 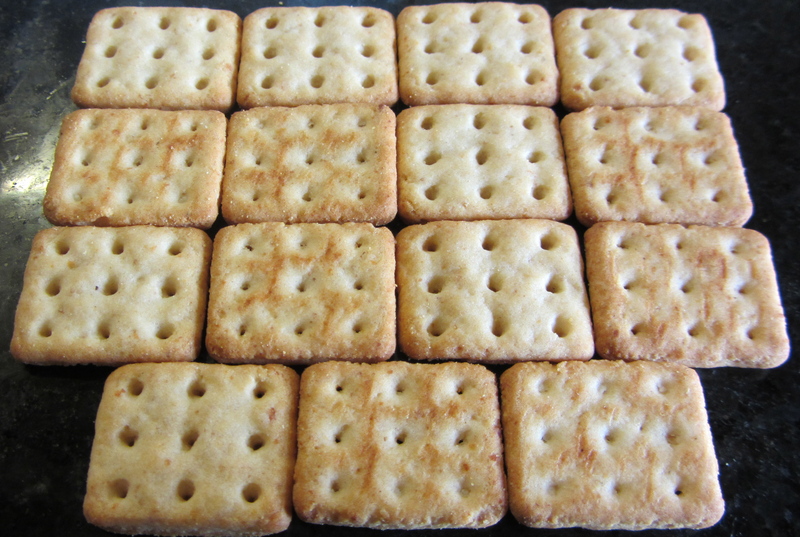 These were in the above packet, they reminded me of a well known brand of baked cheese mini biscuit things, but with far less salt and less strong cheese flavouring. They were very popular with the kids who ate a packet each in about 2 minutes. 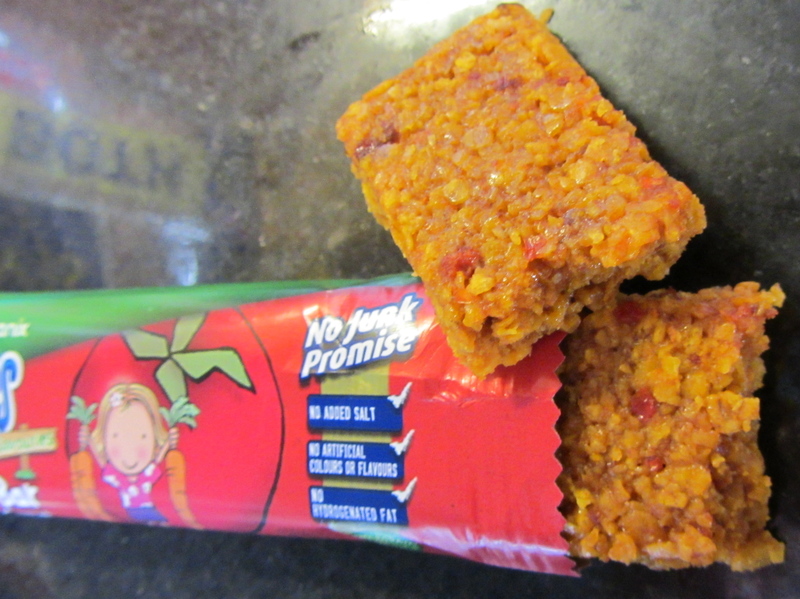 Veg & Oat Bars, namely tomato and carrot. 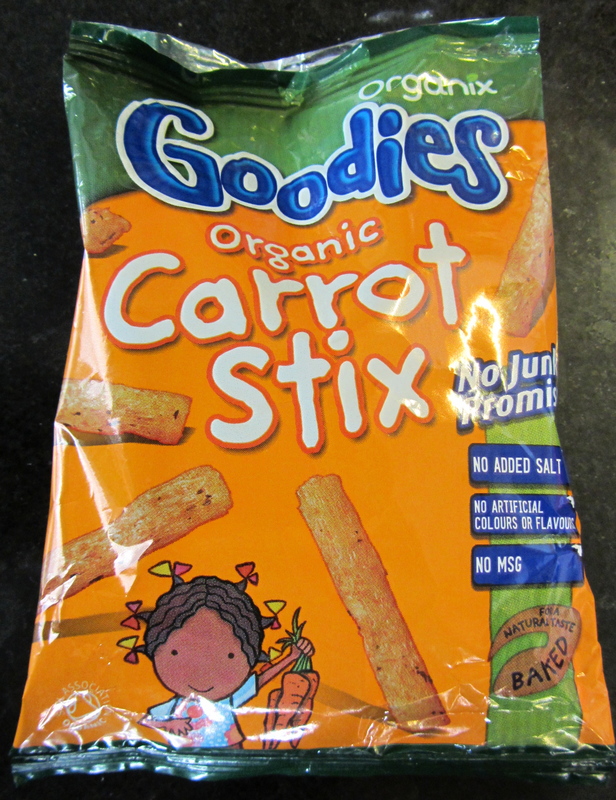 I’m so sorry, we all tried very hard to like these, they sounded so nutritious and looked moist and nommy. Unfortunately all the family found them a bit odd. It’s all a matter of taste though! Sorry Organix! I don’t know why kids love this kind of bottle so much! Perhaps they remind them of baby bottles? My two merrily drank this stuff and said it was really nice. The ingredients again are nice and homely. No aspartame in evidence unlike other drinks I could mention. These are very easy to eat, nice and crunchy, contain carrots of all things, and are very moreish. Ideal for packed lunches and devoured in seconds. I can’t show you a picture of the snacks, because I got distracted for a minute and when I came back they’d all gone! I saved the best for last. Personally I could live off this stuff, never mind the kids! It’s slightly gooey puree, that tastes of real fresh fruit. It’s naturally sweet without added sugar, and is a clever / sneaky way to get children to down one more of their portions of 5 fruit and veg a day. We all really, really loved this, brilliant squeezy packaging too which you can reseal if they don’t finish the lot in one go. Organix have a ‘No Junk!’ policy, and I honestly did have a good look at everything we were sent, it seems they are doing a great job at keeping that promise. (unless I’ve missed something, which I don’t think I have?). I’ll admit not everything on here was to my taste or to my kids’ taste, but that’s just normal isn’t it. I’ve slaved over a hot stove many an evening, only to have them turn their noses up at what I’d consider fantabulous food. Can’t win ’em all! 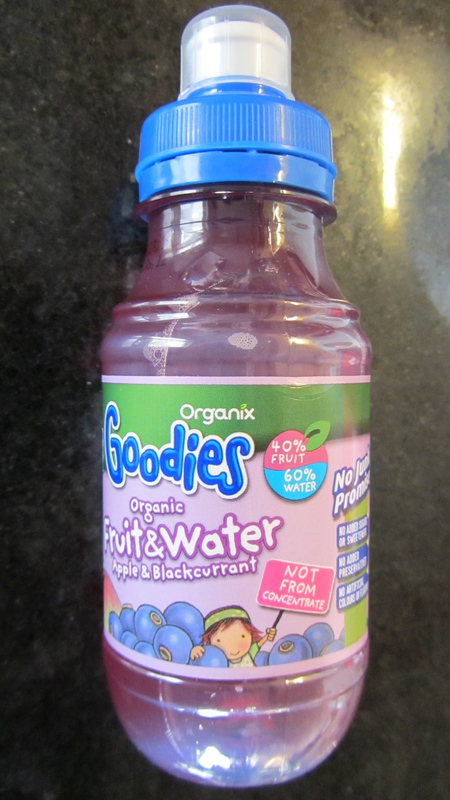 At least you can be reassured that Organix consider and take your child’s nutrition seriously. If you’d like to have a look around the Organix website, please click HERE. Great for packed lunches, snacks, meals and weaning! 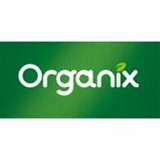 Organix sent me a selection of their products to review, no other financial reward was given. I highly recommend the puree, we could have easily have got through bucketfulls of the stuff! A Head Full of Fluff and Syrup. My bath is running so I thought I may as well write something to kill a little time. News? Erm…I’ve been up since about 5.45am if that counts as news? Heard noises downstairs and wandered down to see what was going on. Found Sausage running around like a lunatic and Darlek perched on the sofa looking dazed wearing her ‘princess’ outfit for the Jubilee celebrations. She said that they’d been watching commercials about something called the ‘non-non leg shaver’ (or something along those lines for a while as kids’ tv hadn’t started and she was desperate to occupy Sausage. My youngest had obviously woken up literally at the crack of dawn and had decided to annoy his sister, being the thoughtful soul he is. I tried without success to get them both back to bed, gave up, went back upstairs and found Horace snoring like his life depended on it, so I collapsed in Darlek’s bed for a while. Consequently my brain has felt like its full of fluff and syrup all day. Tired much? Darlek has sat her SAT’s in a satisfactory manner. Geddit…nudge nudge. She has in fact done really well which is brilliant. I’m still not over the moon that she’s only 7 years old and is having to put up with the pressure of exams, but that’s just the British education system. The night before she started her tests I found her sobbing in her bedroom, absolutely inconsolable – she was worried that she wouldn’t be good enough and that she’d have to move down groups or something. Unbelievable! I had to cuddle her to sleep she was so upset, I was in tears afterwards with the frustration of it all. My daughter is in the education system and is subject to their curriculum and rules, so there’s very little I can do. But I hate that a child of that age can possibly be scared of failing. All she should be worrying about is whether or not she has enough Squinkies. Anyway! On the upside Sausage is his cheery aggravating self and is looking forward to school. He’s developing his sense of humour beautifully and has been practising jokes, mainly about poo. For example ‘How do cows get out of mud?’ Answer ‘With poo on their heads.’ He usually giggles hysterically after gems such as this and I have to laugh because it makes absolutely no sense at all and is all the funnier because of it. Have I already related this story on here? I hope not. Honestly I’m going nuts. I spent half of today thinking it was Wednesday, when it is blatantly Tuesday. My news is that I found a copy of Hugh Fearnley-Whittingstall’s Veg Cook book for a tenner at a second hand book sale at the weekend, and my sister has bought me a beautiful recipe book holder for my birthday. So I have lovingly set both up in my kitchen and pretend to be Nigella Lawson at every opportunity, usually that just involves me flicking my hair slightly and licking my fingers tips seductively whilst ripping a roast chicken in half. Like that works! *rolls eyes* My mother-in-law has a copy of the same book and I am blatantly copying her book choices. Let’s see who can make a herby, nutty, noodly cucumber salady thing first eh Sweara! Race ya! Actually I have already made the above, but it was considered inedible by almost the whole family so I must have done it wrong somehow so I count that as a false start. Today I planned to do an egg plant, tomato thingy and bought 3 medium sized aubergines and a huge block of strong cheese in preparation. I got home after the school run and unfortunately I was foiled by the syrup and fluff in my head so ended up making spag bol with a jar of Ragu instead. Another false start. Tomorrow I will try again, and will probably end up making beans on toast instead or defrosty tea. Maybe a fluff and syrup recipe would be easier to attempt. Watch this space. Actually don’t. It would probably be very messy, and sticky and would mean I’d have to use a spatula to destick my children from their dinner plates. The dishwasher probably wouldn’t like it either. Maybe I won’t try that after all.